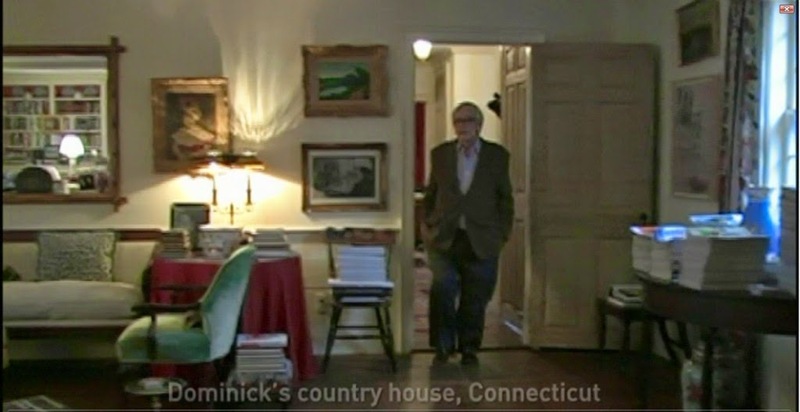 And now we're on to Dominick Dunne's Connecticut country house, which he owned at the time of his death in 2009. 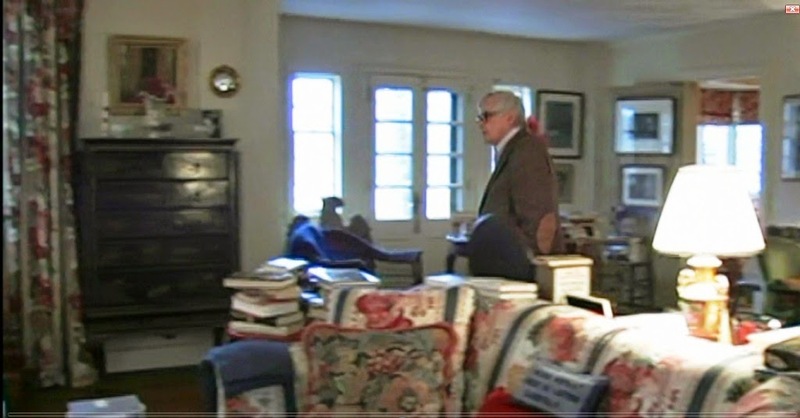 The photos that you see here are screen shots of the documentary, Dominick Dunne: After the Party, which was partially shot at Dunne's house. 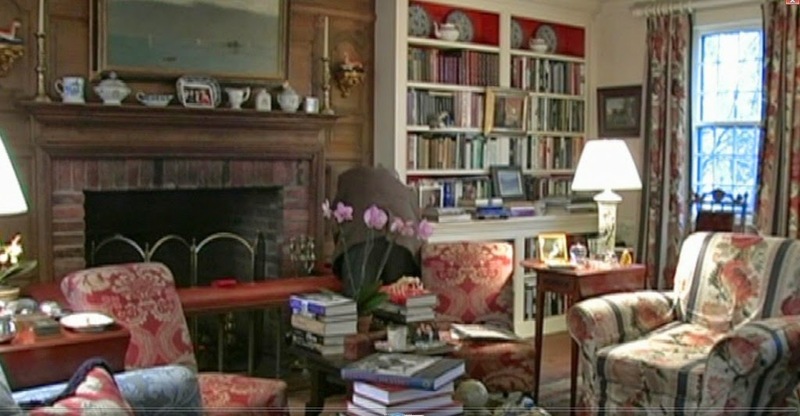 Despite the fuzziness of some of these shots, you can see that Dunne's living room was filled with lovely fabrics and antiques. 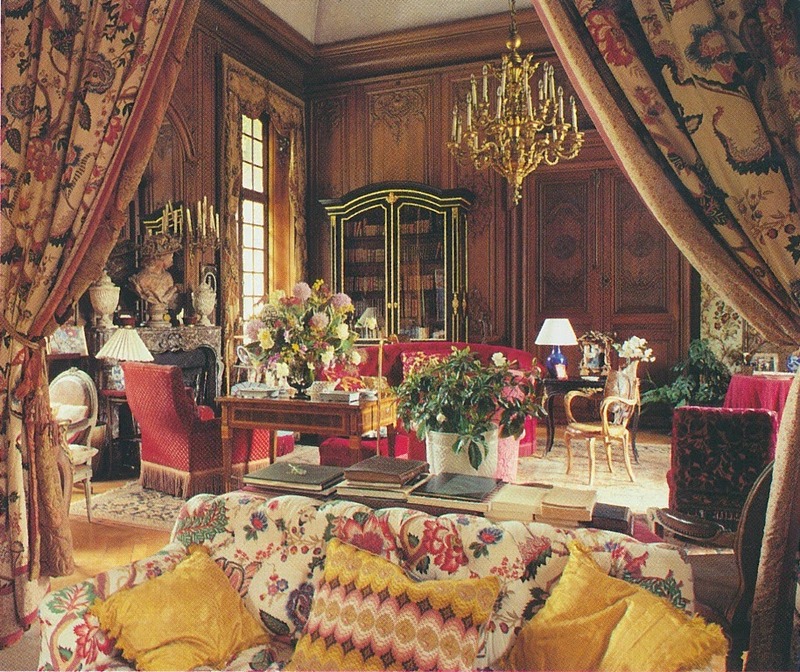 I spy La Portugaise fabric by Brunschwig & Fils on a sofa and two chairs as well as damask-covered slipper chairs in front of the fireplace. There were needlepoint pillows, antique porcelain and ceramicware, lots of pictures, lots of books, and a fireplace fender. What could be cozier? 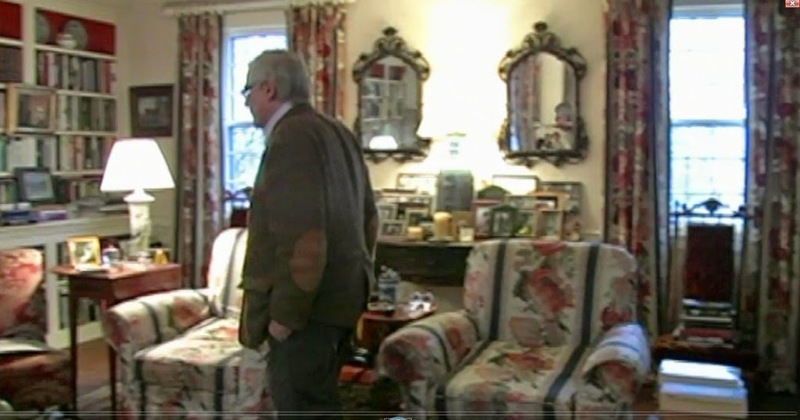 And if any of you watched Dunne's television show, Power, Privilege, and Justice, you will recognize the living room because it was here that Dunne filmed his commentary for the show. I would say that the room's decor was fitting for a show about privilege, albeit the kind of privilege that leads to murder and mayhem. The decor might be too traditional to some, while others might find it a little too chockablock. 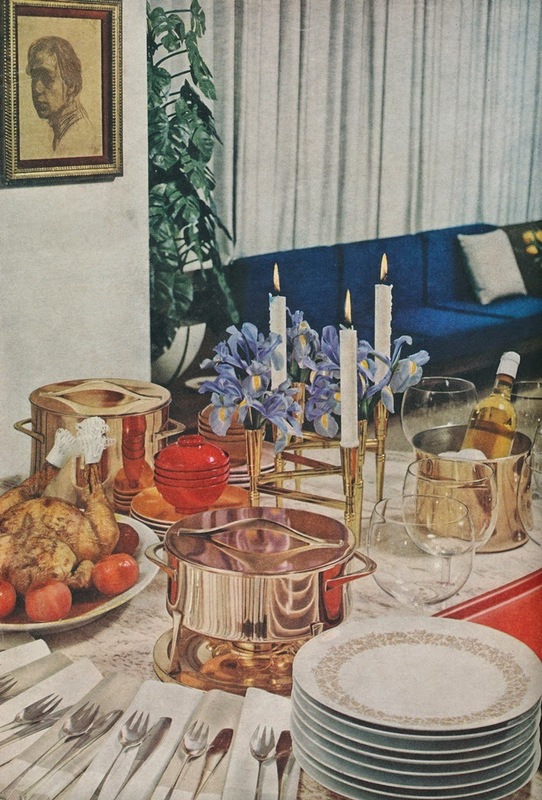 However, the one thing that I think most of us could agree upon is that the house was comfortable, cozy, and personal. Boy, do I miss Dominick Dunne. I thought of him the other day as I was planning my summer reading, because his books were really the best kind of reading for a lazy summer day. Murder, high-society, and scandal. I don't know about you, but those are exactly the kind of subjects about which I want to read while lounging by the pool. (Can't you just picture being on a sunny beach- slathered in Bain de Soleil Orange Gelèe, no less- with a copy of The Two Mrs. Grenvilles in one hand and an Evian Brumisateur in the other?) But salacious subject-matter aside, Dunne's books remain compelling because they were well-written. 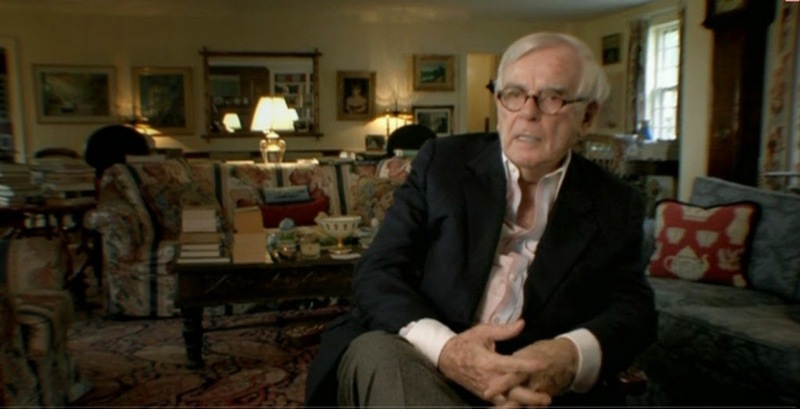 Dominick Dunne was no hack writer. This stroll down memory-lane prompted me to pull my copy of Dunne's memoir, The Way We Lived Then: Recollections of a Well-Known Name Dropper, down from the shelf. 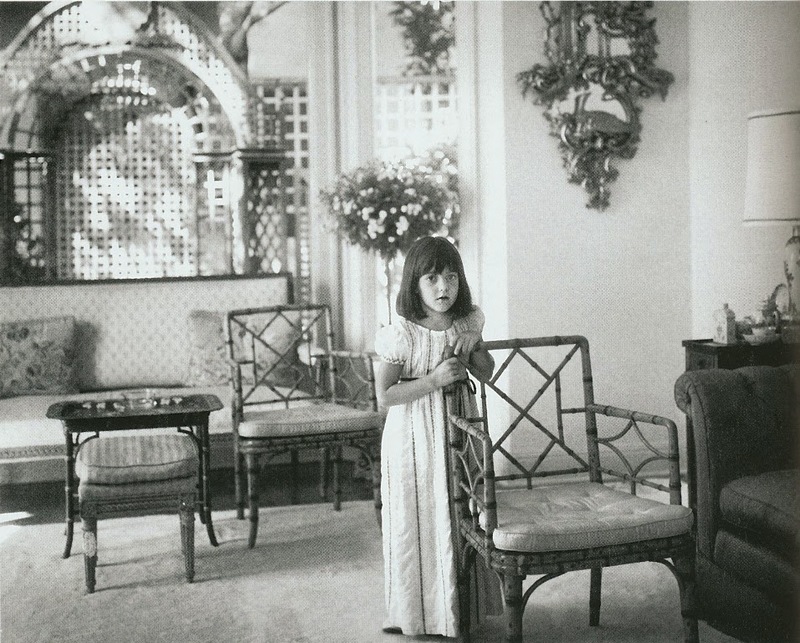 Of course, Dunne's reminiscences of his life in 1960s-era Hollywood are fascinating as are the many photos of the rich and famous who frequented the Beverly Hills home that Dunne shared with his wife and children. 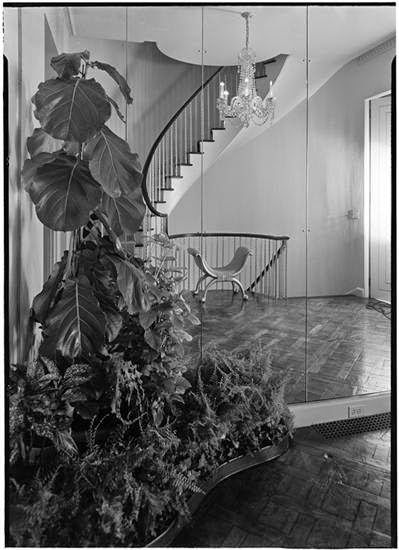 But what really captures my attention are the photos of Dunne's house, which was furbished in an elegant and rather formal style. This really doesn't come as a surprise considering that the Dunnes and their friends often dressed in formal attire to attend weeknight dinner parties. 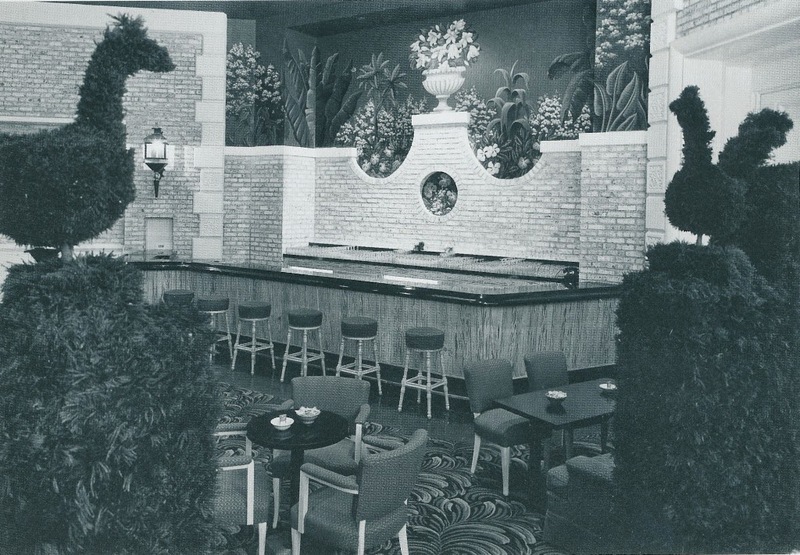 When you look at these photos, you'll notice quite a bit of trellis, some of which had been installed especially for the Dunnes' Black and White Ball in 1964. 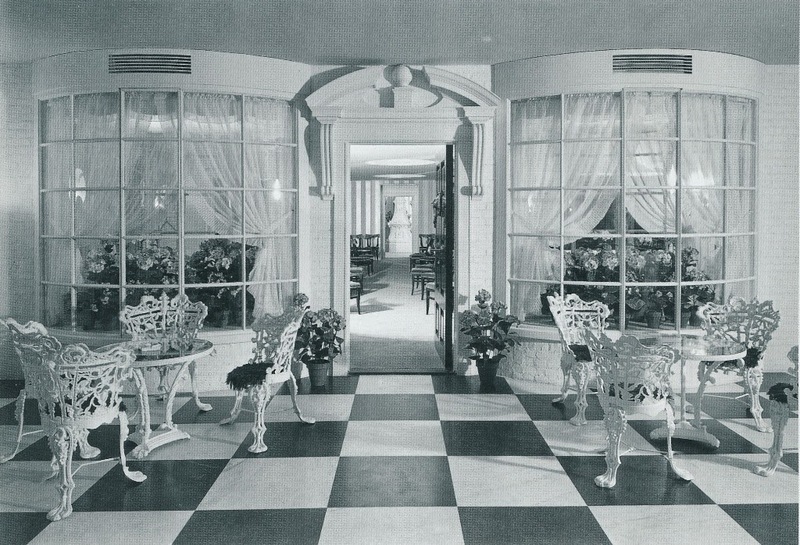 When My Fair Lady was released, the Dunnes had been enchanted by the film's Cecil Beaton-designed Ascot scene, which was famously decorated entirely in black and white. 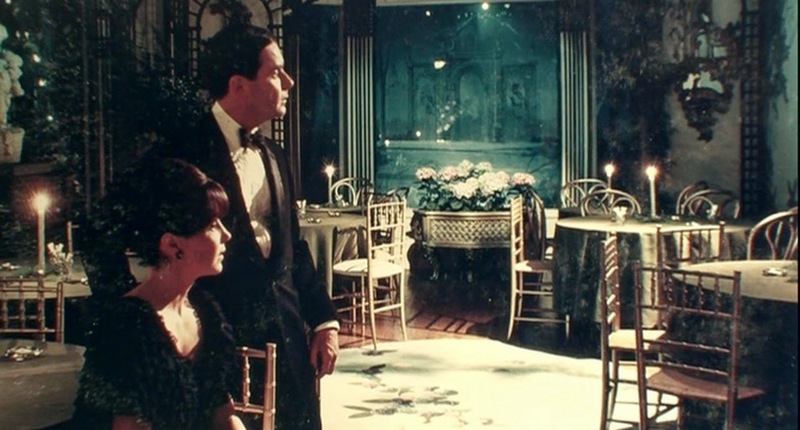 This scene inspired the couple to host a Black and White Ball, which was attended by Hollywood's A-list crowd. 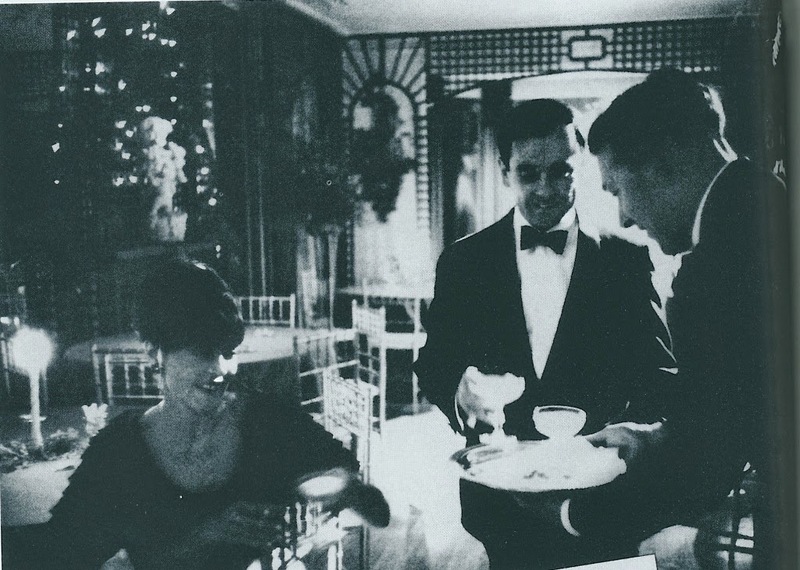 The ball was also attended by Truman Capote, who by the looks of Dunne's photos appeared to have had a very good time. 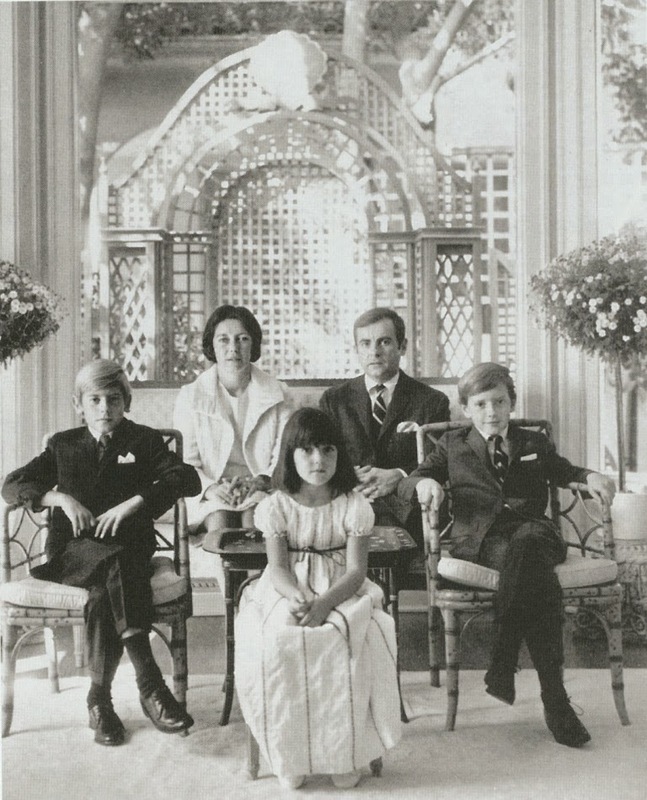 Capote, of course, went on to host his own Black and White Ball, to which the Dunnes were not invited. As Dunne once said of Capote, "he was duplicitous." But back to the trellis. The Dunnes chose to keep some of their trellised-party decorations in situ, a decision which is completely understandable. That trellis looked too beautiful to dismantle. 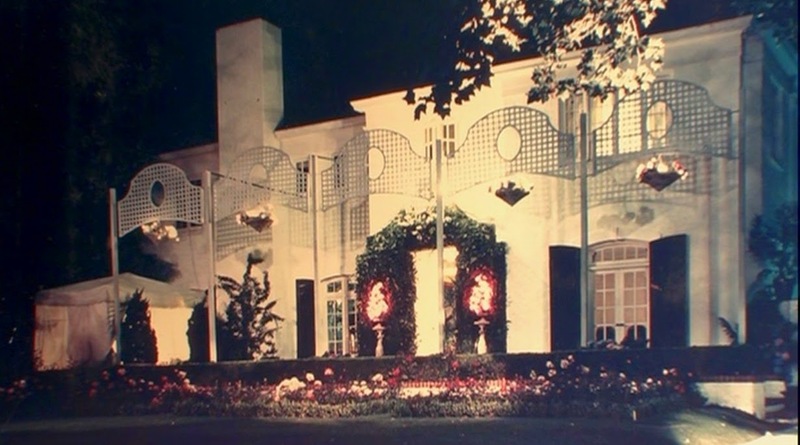 And later this week, I'll take you on a brief tour of Dunne's Connecticut home, which might have lacked the beautiful trellis but which was no less striking. 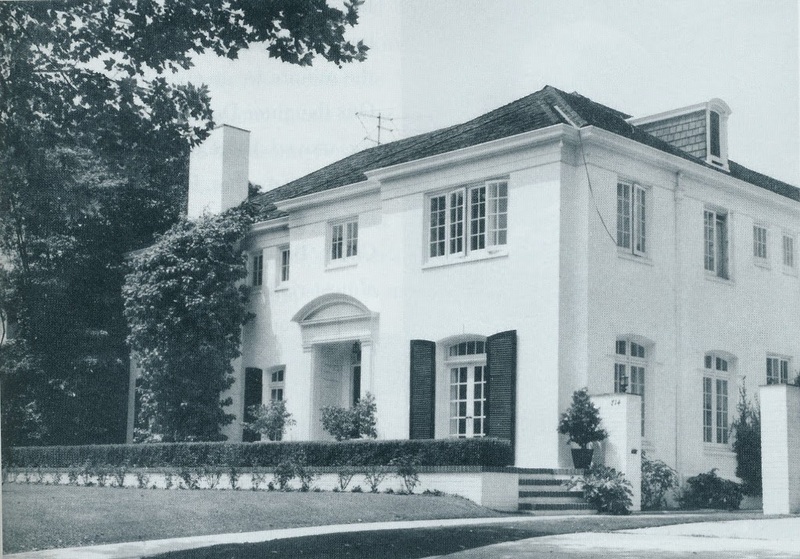 The Dunnes house, which was located on Walden Drive in Beverly Hills. The exterior of the house on the night of the Dunnes' Black and White Ball. Dunne and his wife, Lenny, photographed as they awaited their guests. Dunne referred to their Black and White Ball as the high point of their social life. The Dunnes' daughter, Dominique, posed in front of a trellised-backdrop. Sadly, Dominique was later murdered by her boyfriend, an event which impelled Dunne's career in journalism and his advocacy for victims' rights. A glamorous shot of Dunne's wife, Lenny. 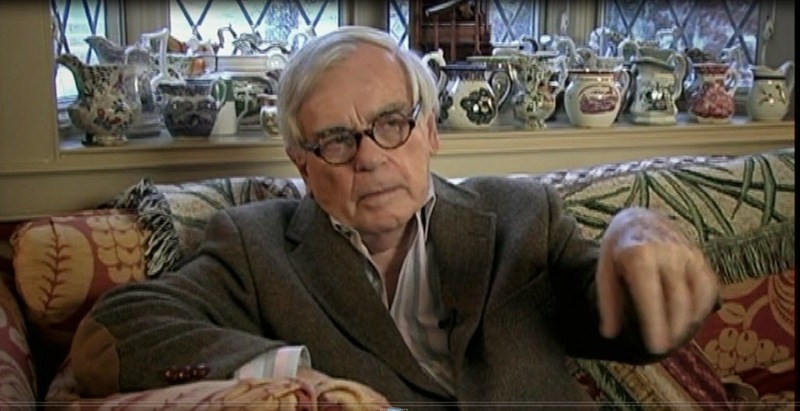 All photos from The Way We Lived Then by Dominick Dunne and the documentary, Dominick Dunne: After the Party. 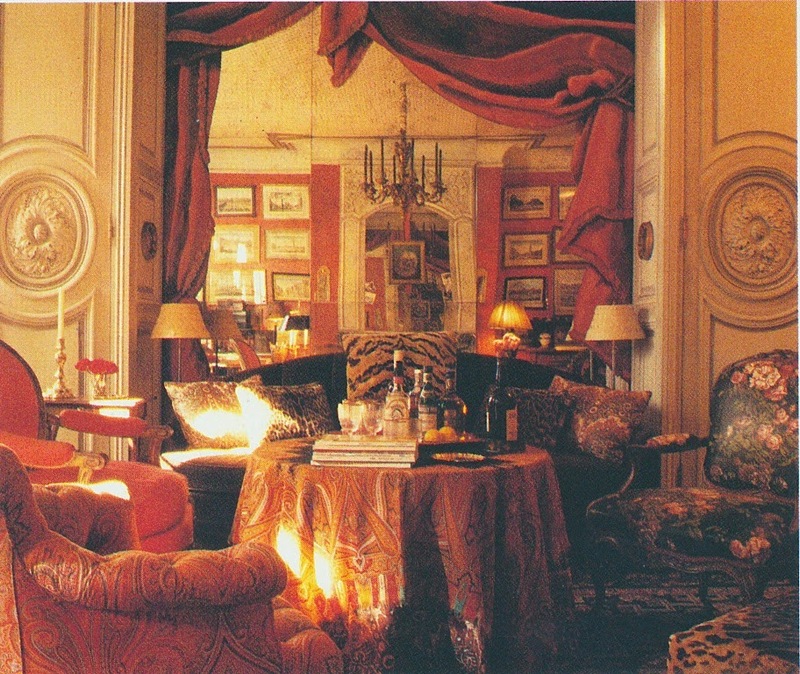 There is rarely a contrived scheme or method to such interior design, it is more often a combination of beautiful and idiosyncratic items- just as carefully selected as a single object in a minimal interior- which come together to create a highly personal and enchanting scenario which would be a nightmare to move. "Highly personal" and "enchanting". 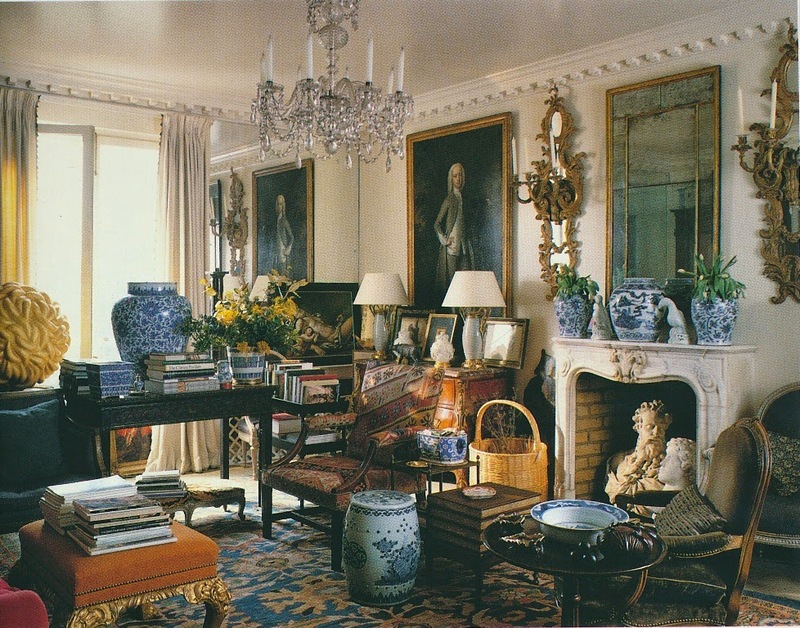 Those must be the qualities that draw me to these particular interiors. When I study rooms such as these, I am always left wondering who the homeowner is. I just know that he or she has to be interesting, eccentric, erudite, or even squirrely. But when I see a room that has been decorated in an affected manner, I don't wonder who owns the home, because truthfully, I don't really care. The room no longer has personality; it is simply a congregation of furnishings that probably mean very little to the homeowner. 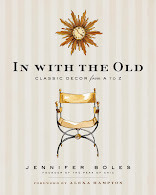 Long might have agreed with me on this point, as he also wrote in the introduction, "True clutter is very different from those artfully arranged tablescapes, piles of expensive books and endless buttons and bows aimed to give an instant lived-in look." If you study these rooms, you'll notice that there is a method to the madness, so to speak. Pairs of objects and collections arranged en masse, for example, do help to create some semblance of order. And although I often complain about the current fad for willy-nilly decorating, I can't pin that criticism on these interiors. The rooms seen here were not decorated for effect, nor did they take shape quickly. Rather, they developed their personalities, and enchanting ones at that, over time. And Long was right about one more thing: these scenarios must have been murder to move. 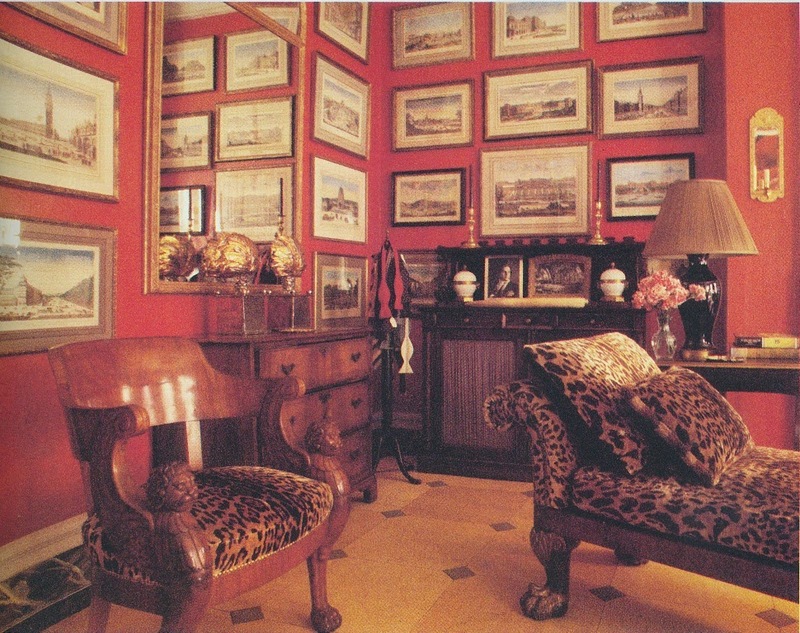 Photo at top: Isn't it interesting that the house of Sir John Soane was the lead photo to the Clutter chapter? 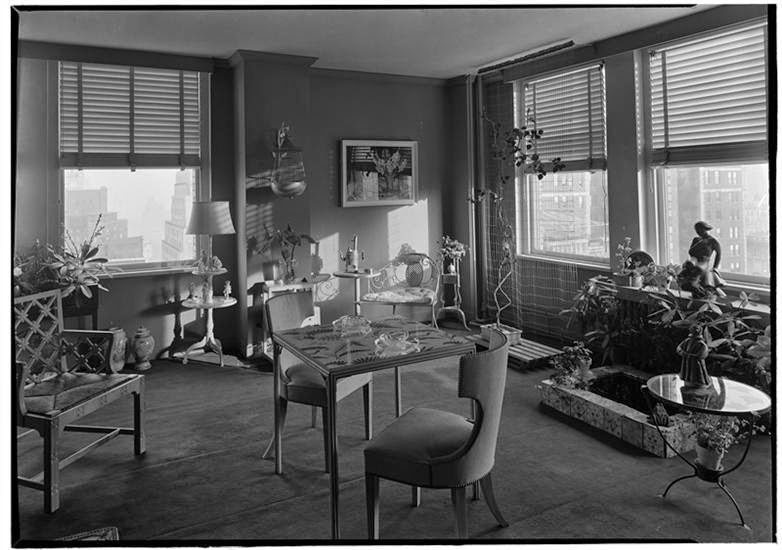 The Manhattan studio apartment of Richard Lowell Neas. 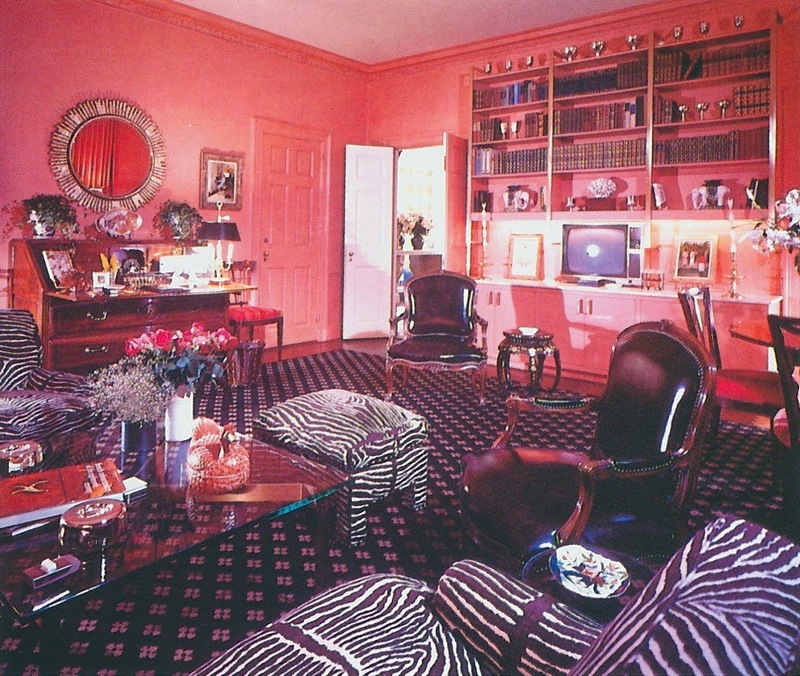 The Long Island living room of Allen Murphy. 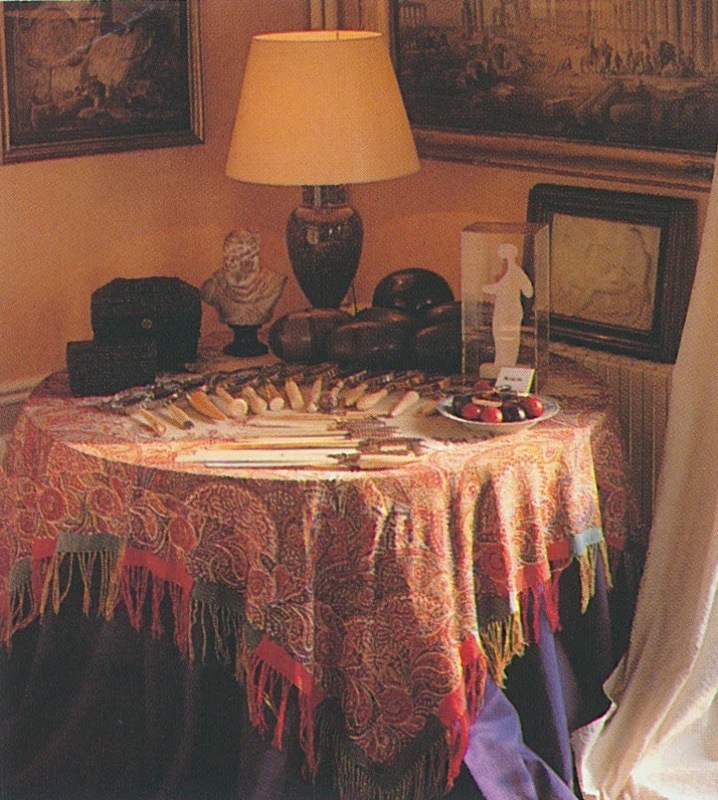 A collection of ivory-handled magnifying glasses and letter openers. 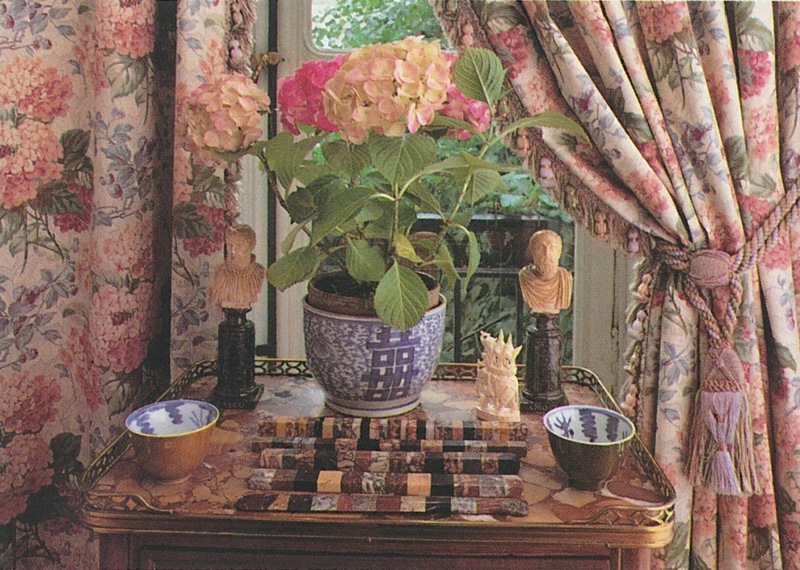 A grouping of blue and white porcelain, busts, and marble. 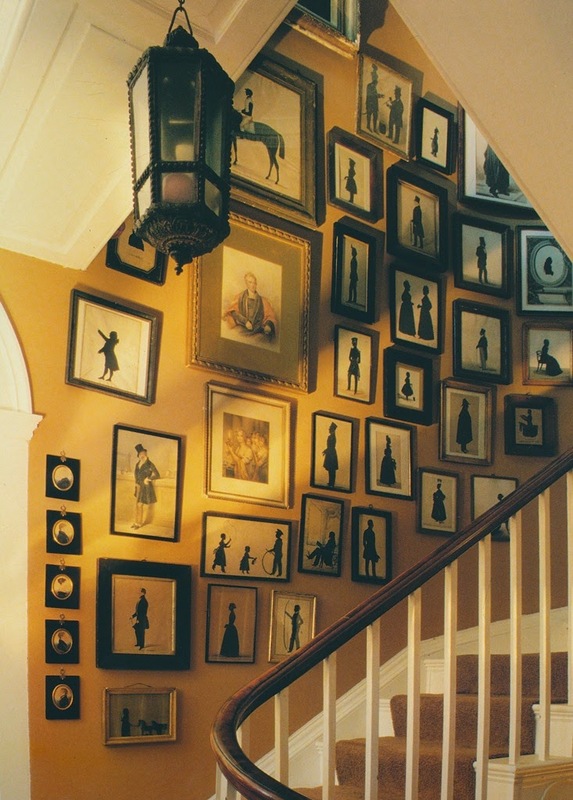 A collection of eighteenth- and nineteenth-century silhouettes, which are displayed in a house in Sussex. 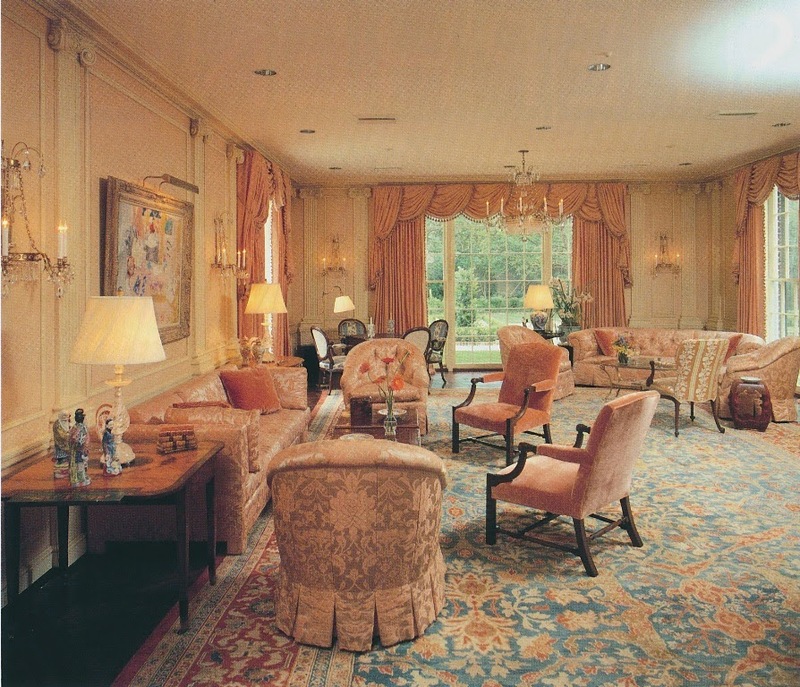 The Manhattan sitting room of the late Keith Irvine. 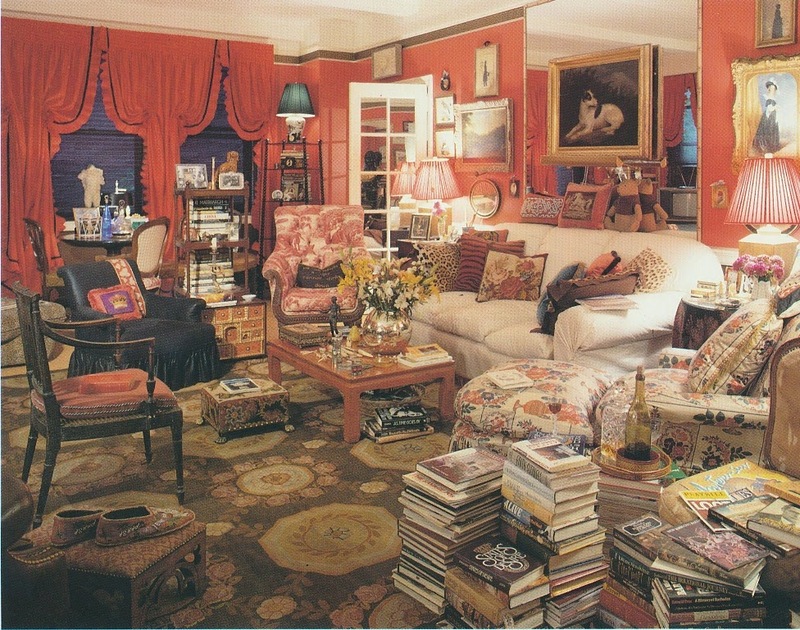 As much as I admired Mr. Irvine, I have to say that I would go bonkers living with so many piles of books on the floor. 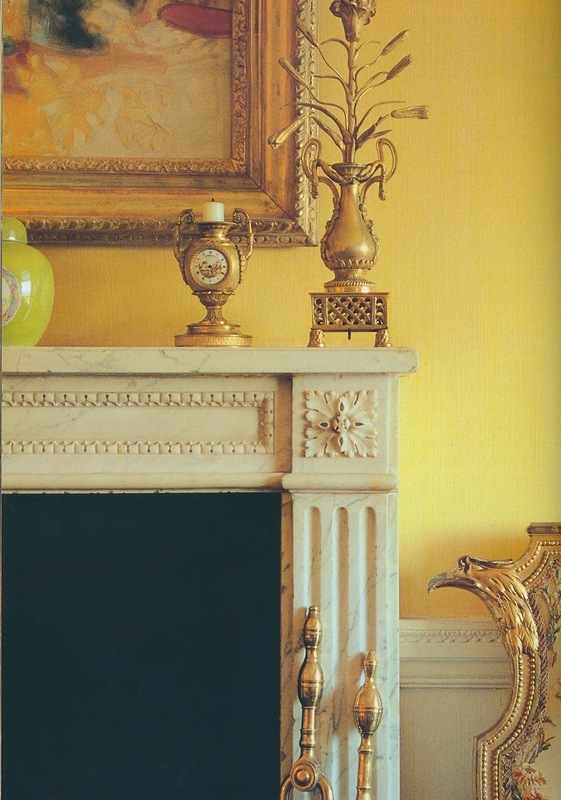 All images from Interiors by Minn Hogg and Wendy Harrop. 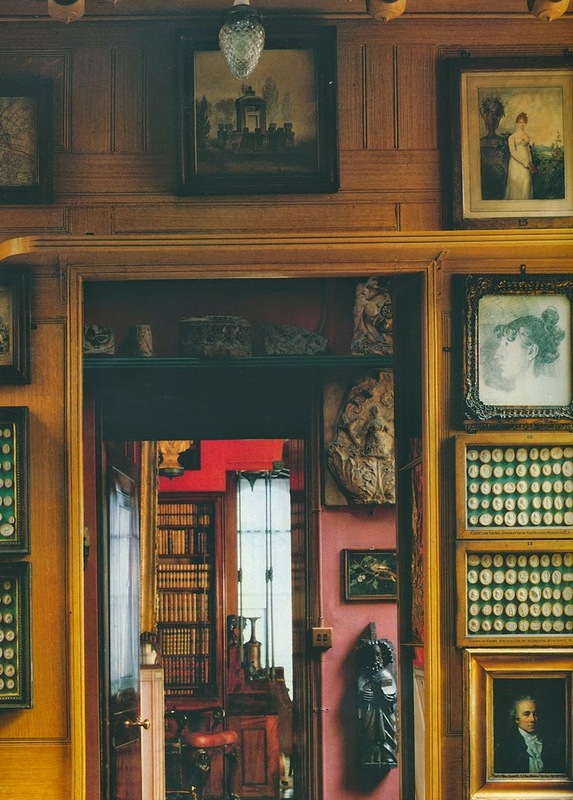 While I was wide awake at 2 a.m. the other night, the most random image popped into my head: a photo, seen above, which shows the garden room of architect Archibald Brown's River House apartment. When I first saw the c. 1931 photo, which was taken by photographer Samuel H. Gottscho, I was intrigued by those sunken flower beds. How clever and, perhaps, how messy those indoor beds were. I would assume that the flowers were real, if the watering can placed alongside the bed was any indication. I wonder if this garden room was the work of Brown or that of Eleanor McMillen, the McMillen Inc. founder who later married Mr. Brown in 1934? I don't have the answer, but I did take this nocturnal ponderment as a sign that I needed to write a blog post about creative ways that homeowners have attempted to bring the outdoors inside. 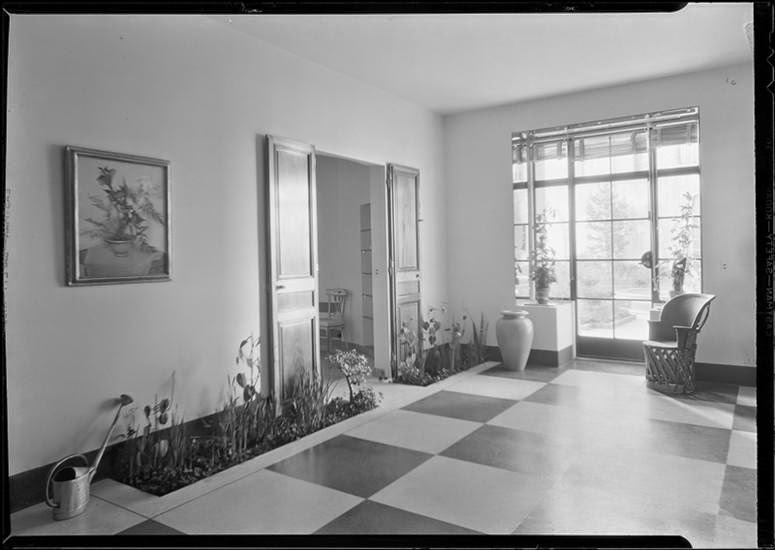 The concept of creating an indoor garden space is one that I explore in my lecture on 20th-century design, which I have been giving to audiences around the country. 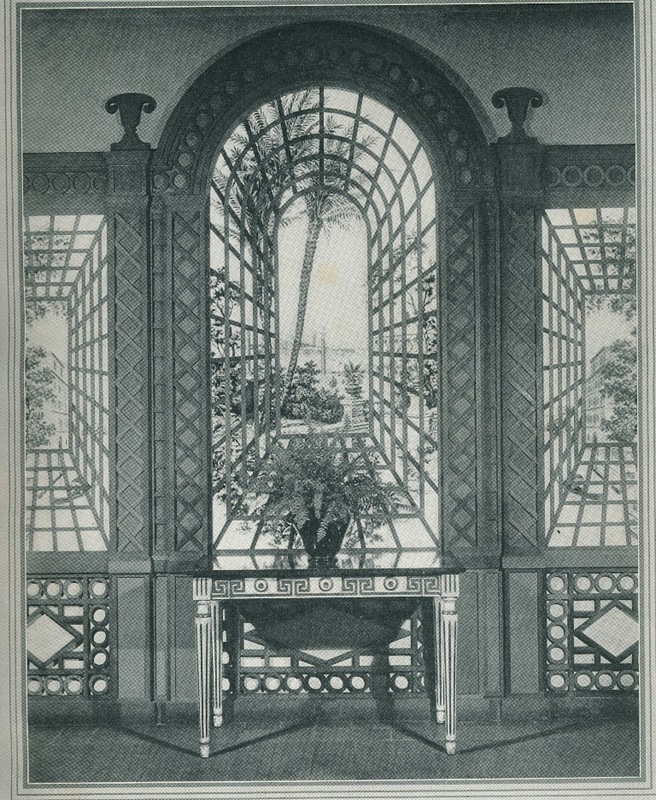 Specifically, I discuss orangeries and winter garden rooms, both of which typically housed citrus trees, palm trees, and ferns. But if you look at interior photos from the 1920s and 1930s, you'll find all kinds of imaginative and, at times, theatrical ways that homeowners have introduced garden-like decorative elements to indoor spaces. In some cases, windows or trellises were employed as part of a ruse to fool people into thinking that they were viewing a real garden when, in fact, they were looking at painted scenes. Other homeowners took an easier route by simply using floor screens that had been painted with images of flowers or pastoral scenes. 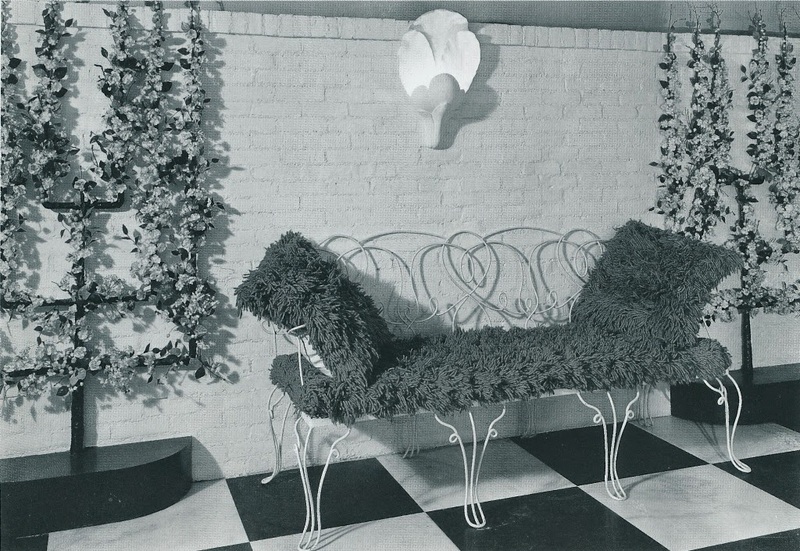 One of the most enthusiastic champions of the indoor garden tableau was Dorothy Draper, who decorated quite a number of restaurants and hotels with elements typically seen outdoors: fountains; espalier; wrought-iron patio furniture; and topiaries. But Draper did not limit these indoor garden fantasies to her commercial projects. 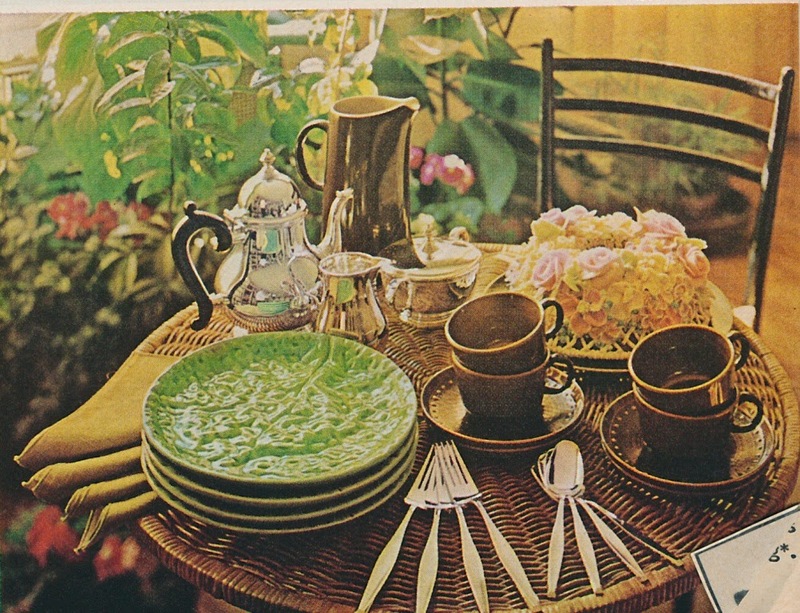 In her confidence-building, morale-boosting tome, Decorating is Fun!, Draper wrote a case history of "A Country Wren Who Turned into a City Sparrow". 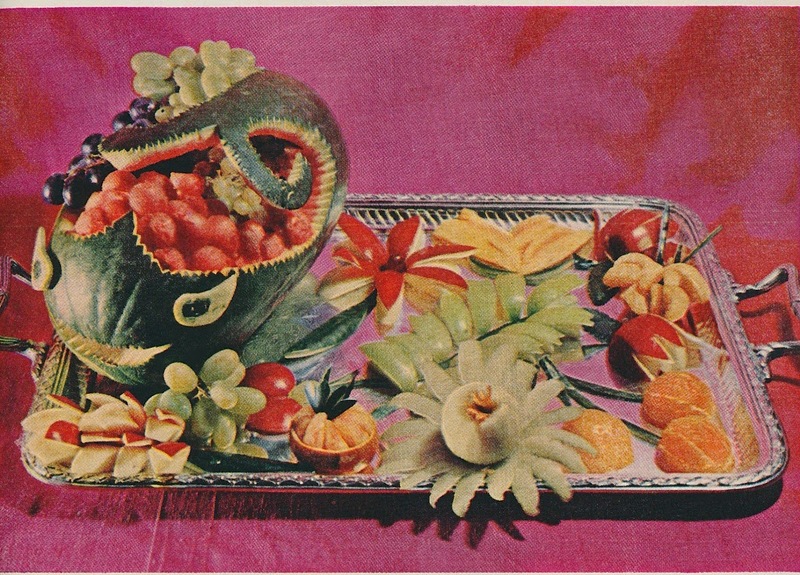 Poor Mrs. White was bereft at having to leave her country garden behind when her husband's job transferred them to the city- and to an apartment. After a time spent being "positively mopey", Mrs. White had a stroke of genius: she turned her living room's bay window, which was south-facing (hurray! ), into a garden oasis by building a short door sill in front of the window, laying the floor with linoleum, scattering pebbles over the floor, and placing two tall rubber plants and an assortment of other potted plants onto the pebbles. Further heightening the garden feel were red trellis, which was placed on the walls surrounding the window, and a "lovely old English bird cage with two happily married bullfinches in it." 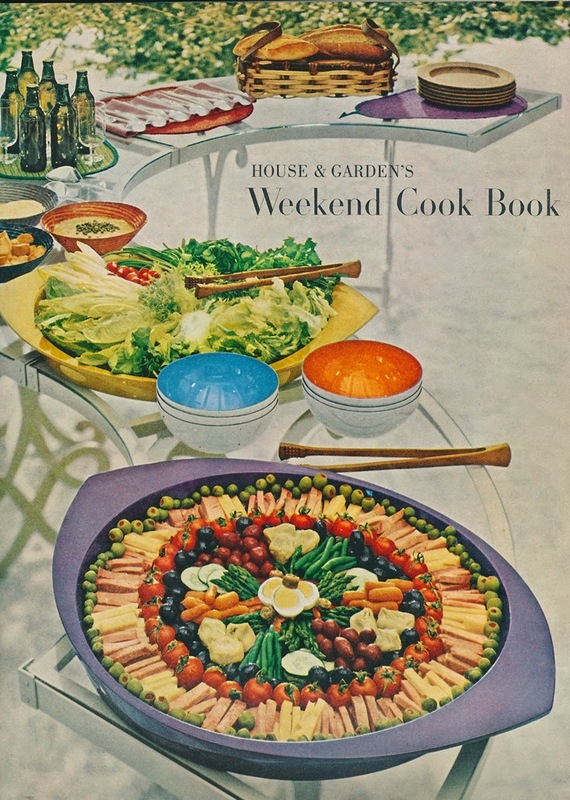 The result was such that, "Mrs. White likes her sunny little garden almost better than the one she left behind in the country." So you see, no matter where you live, you too can create an indoor garden for yourself. All it takes is a little creativity, some know-how, and perhaps a bullfinch or two. 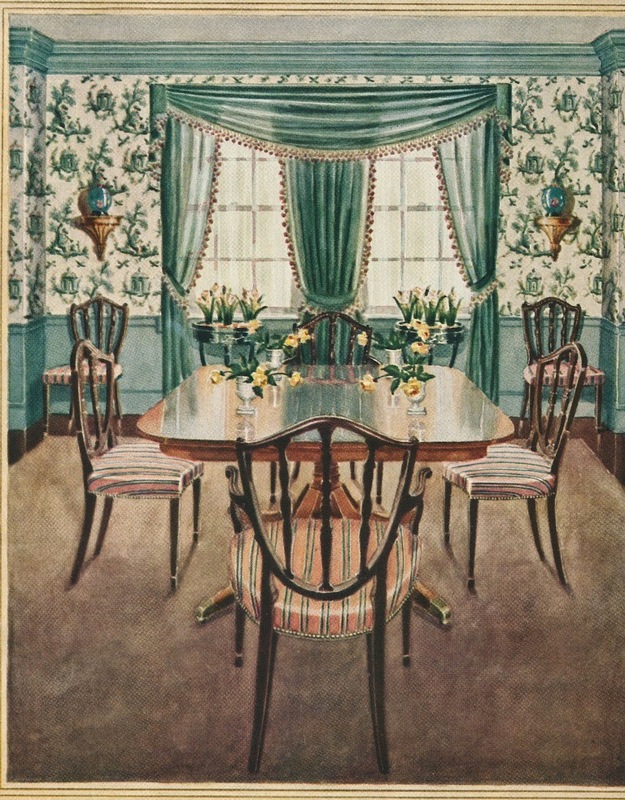 A rendering of a dining room decorated by Diane Tate & Marian Hall. The most conventional way of giving a room a garden feel is by displaying flowering plants in front of a window, as seen here. 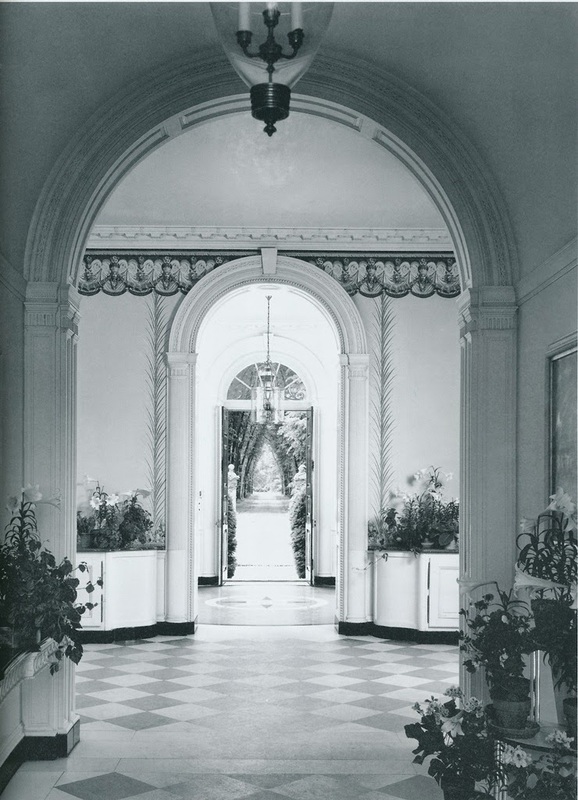 In the Gallery of the Armour House, Lake Bluff, Illinois, a mass of potted plants and hand-painted palm fronds on the walls echo the view beyond the front door. 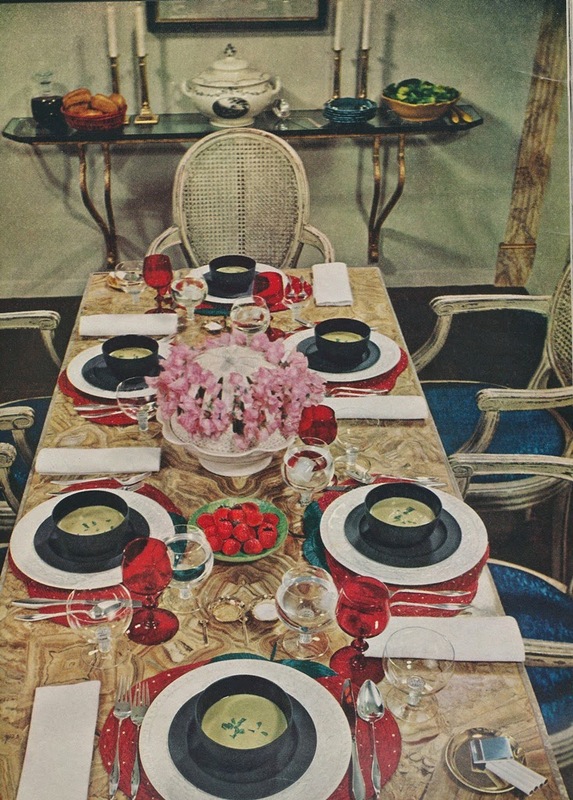 Frances Elkins was the decorator. 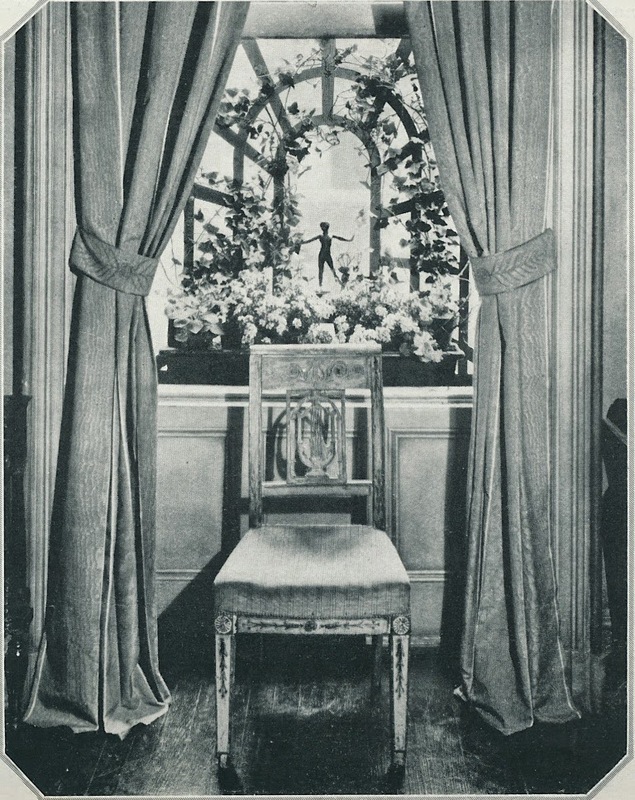 In this 1920s-era room, a trellis and flower box were placed outside of the window. Here, the garden element is not quite indoors, but almost. 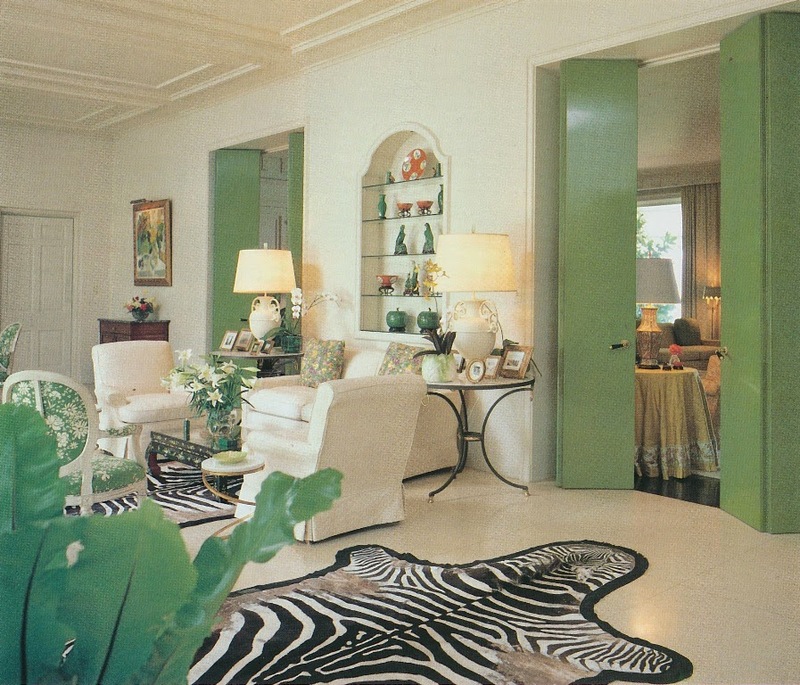 Paula Robertson, decorator. 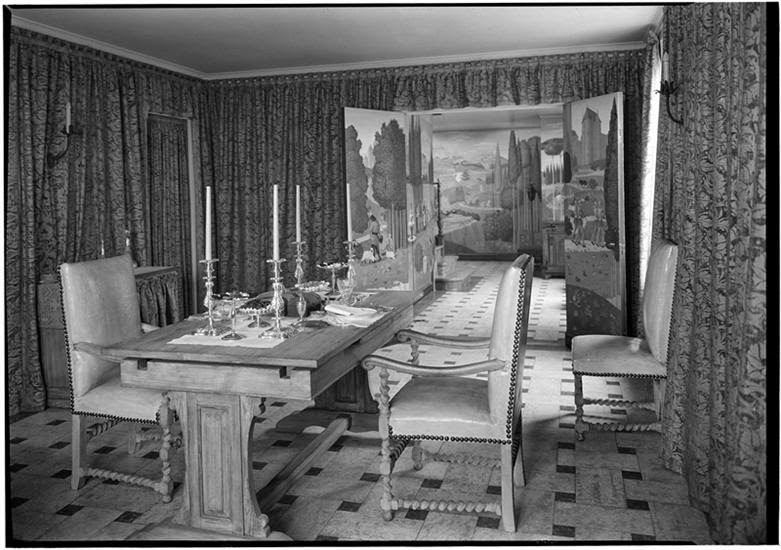 In this room by Wanamaker, outdoor garden scenes of Venice were created through the use of trellised arches and trompe l'oeil-painted roller blinds. The roller blinds evidently covered up windows that displayed "unsightly city views." 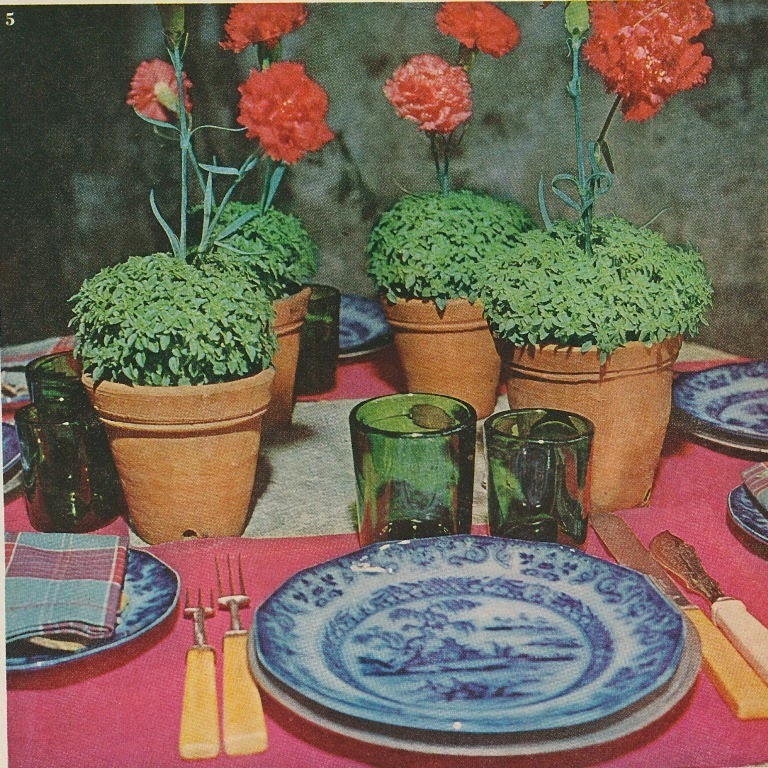 A far easier method of decorating with budding blooms was the painted screen. This example was painted by Etienne Drian around 1938. 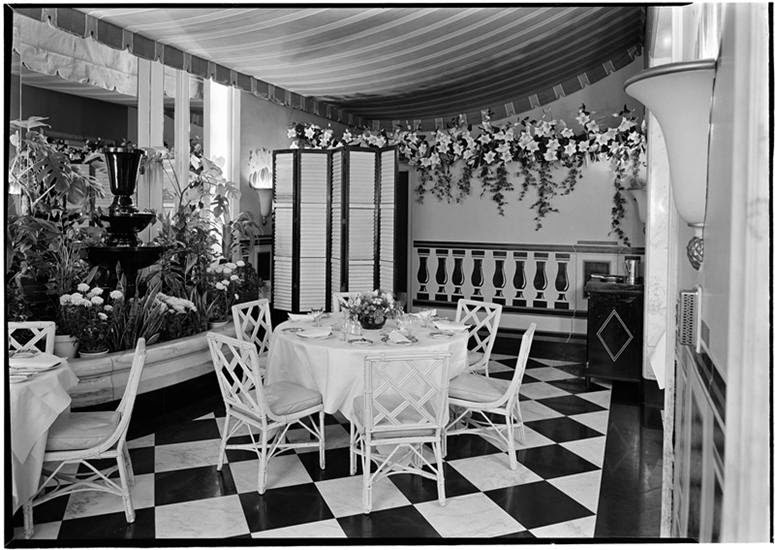 The two photos seen above show the Garden Lounge at Hampshire House, which was also decorated by Draper. The espaliered fruit trees are faux. And yet another Draper creation: the Peacock Court at San Francisco's Mark Hopkins Hotel. Photo at top and others as noted: Samuel H. Gottscho photographer, from the Collections of the Museum of the City of New York. 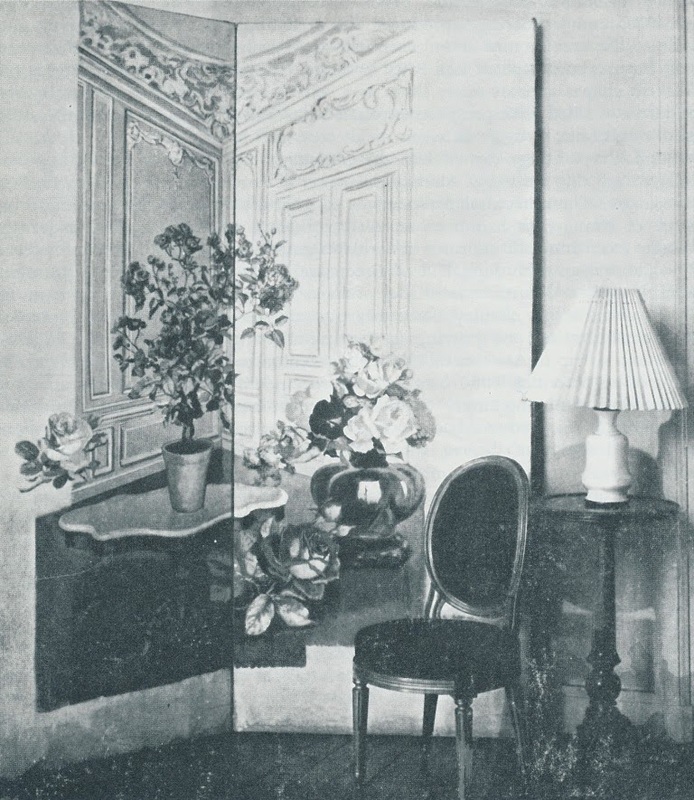 Tate & Hall, Robertson, and Wanamaker photos from "The Book of Colour Schemes"; Elkins photo from "Frances Elkins" by Stephen Salny; Draper photos from "In the Pink" by Carleton Varney; Drian screen photo from Martin Battersby's "The Decorative Thirties". 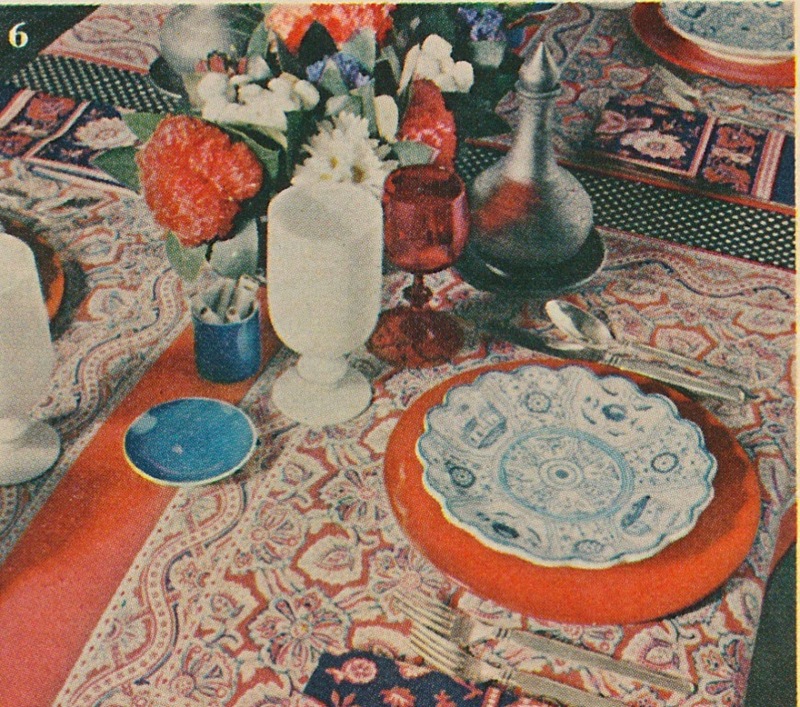 Yesterday brought the sad news of designer Betty Sherrill's death. 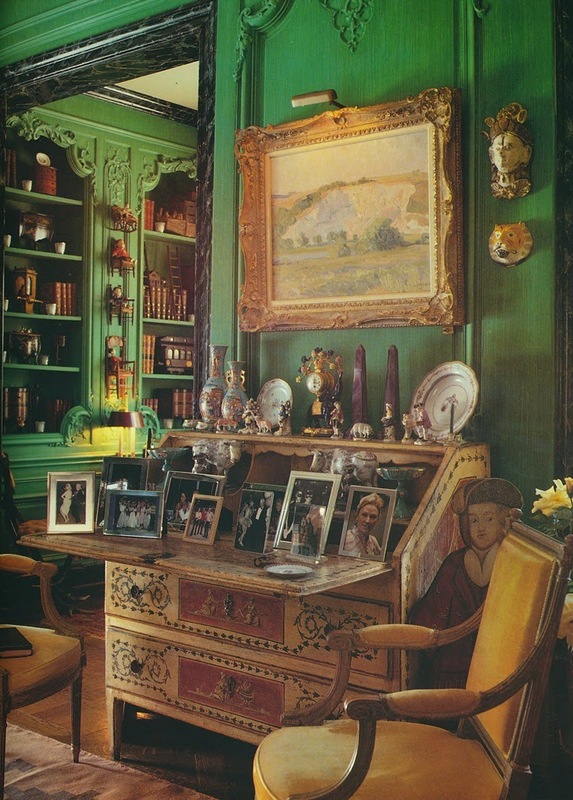 For decades, the New Orleans-born Sherrill was the doyenne of American decorating. 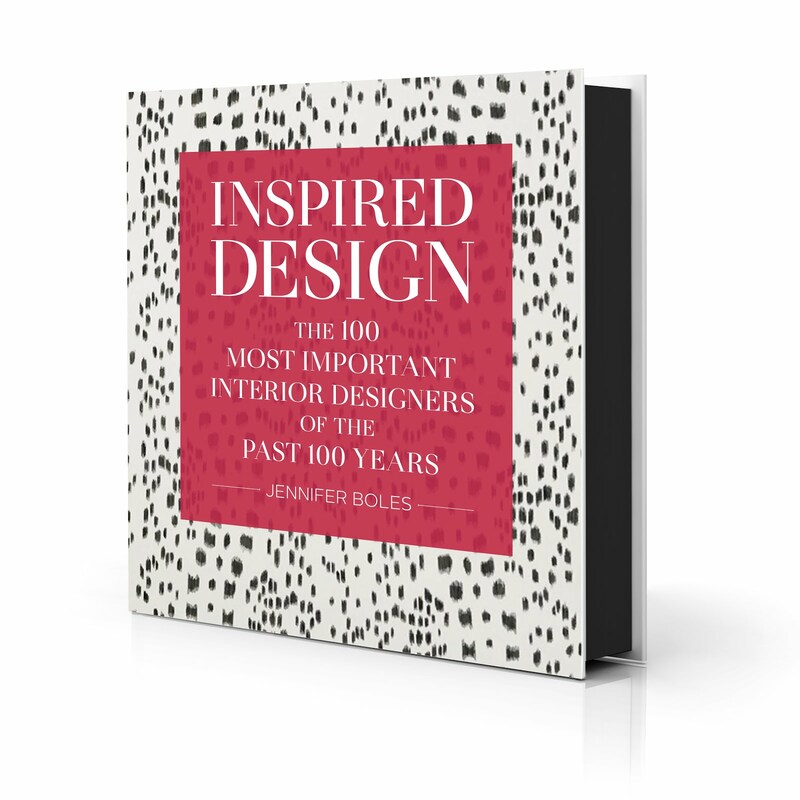 Having joined McMillen Inc. as a young designer in 1952, Sherrill later became the firm's president, a role for which the talented designer seemed made. 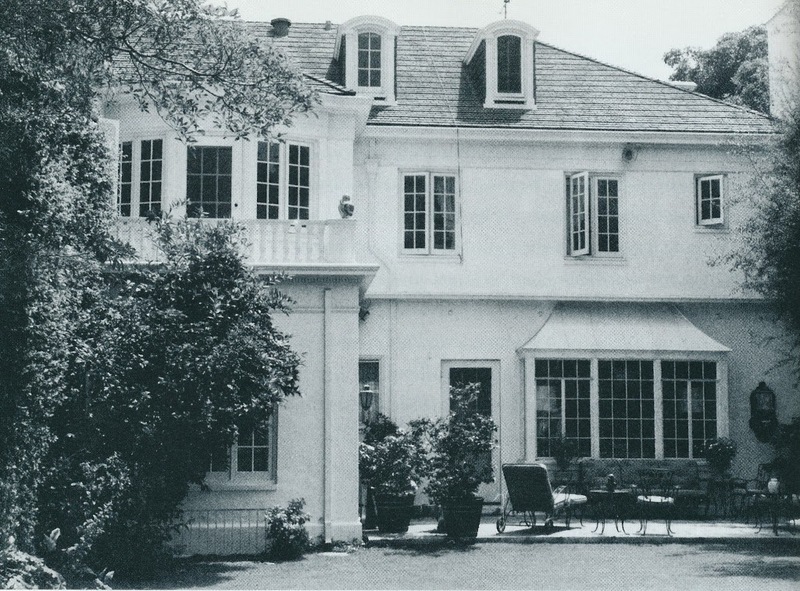 Under Sherrill's tutelage, McMillen Inc. operated in the upper echelon of the design world and continued to maintain the high standards set by the firm's founder, Eleanor McMillen Brown. 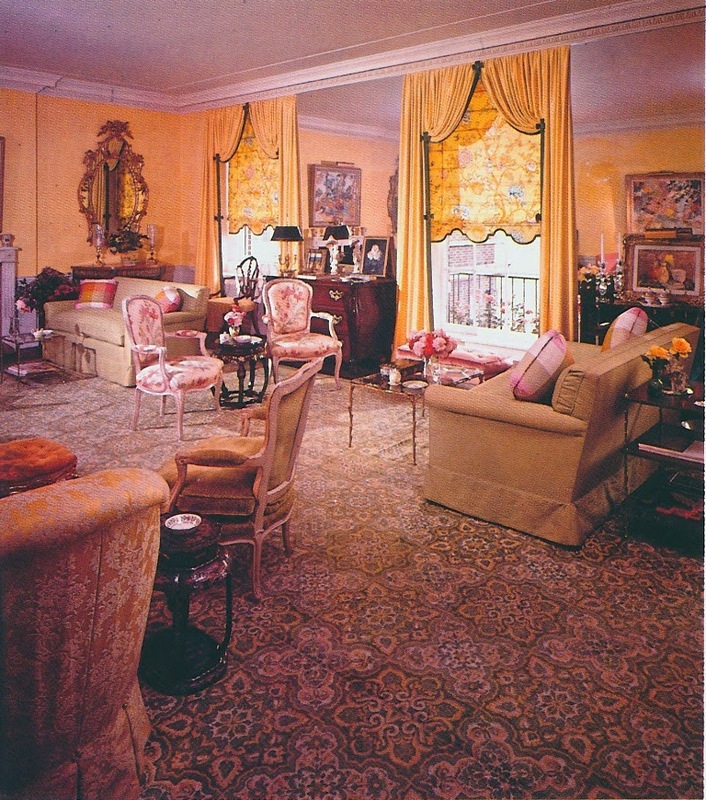 Visit any of the marquee buildings of New York's Upper East Side, and you'll likely find a number of McMillen-designed apartments. This is no coincidence. 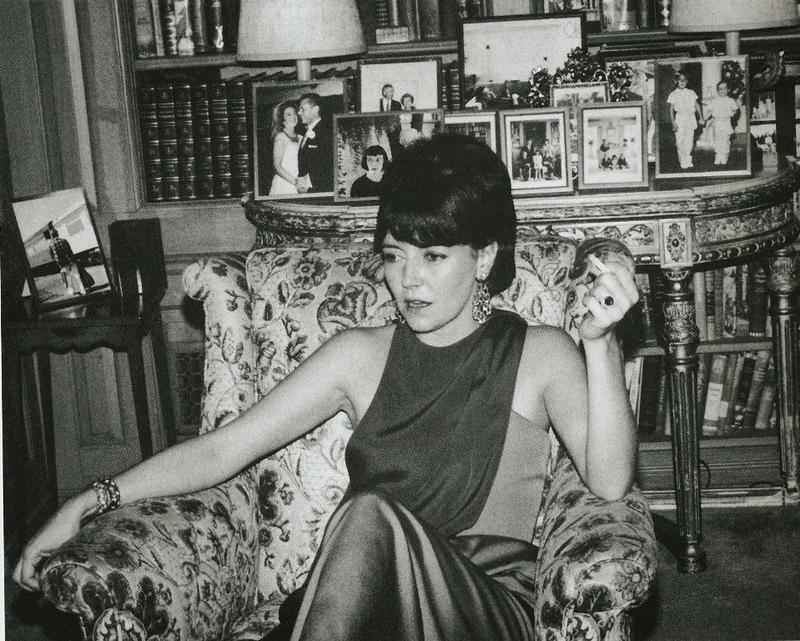 Betty Sherrill moved in the same social circles as many of her clients, who have included members of society, industry, and royalty, and with her innate understanding of luxury, taste, tradition, and discretion, Sherrill and her staff became the go-to decorators for those seeking help with their manses and their maisonettes. 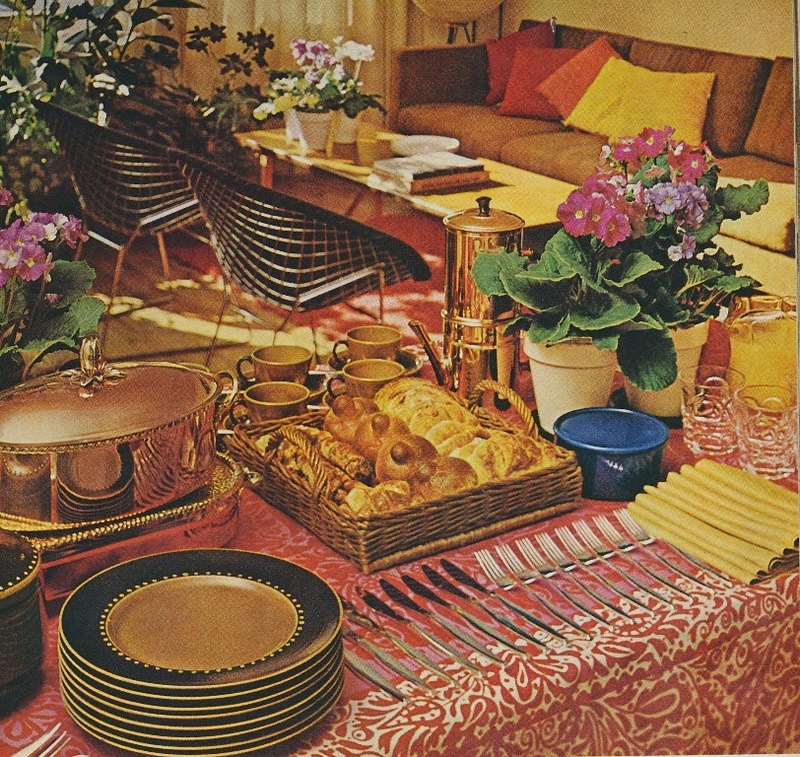 Betty Sherrill knew how her clients wanted to live, because she lived in a similar fashion. 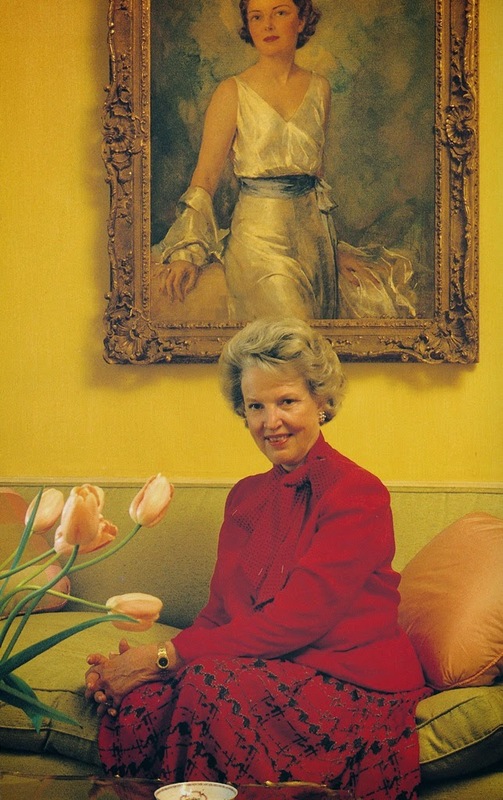 Although her death marks the end of an era, it does not mark the end of McMillen Inc. With Sherrill's daughter, Ann Pyne, now serving as President and her granddaughter, Elizabeth Pyne, working on staff as a designer, the firm is poised to remain one of this country's premier design firms. With a legacy that includes Eleanor McMillen Brown and Betty Sherrill, it shouldn't be any other way.